The DUP leader has said Jonathan Bell’s BBC interview about a flawed green energy scheme directly led to the collapse of the NI assembly. Arlene Foster was giving evidence to the Renewable Heat Incentive inquiry. She was in charge of energy matters for NI when the scheme was set up in 2012, while Mr Bell was enterprise minister between 2015 and 2016. Overgenerous subsidies meant costs grew and left taxpayers with a £490m bill. On Tuesday, Mrs Foster told the inquiry that Mr Bell – who was her successor as enterprise minister – had pressed a “nuclear button” by going public with claims that DUP special advisers delayed his plans to close down the controversial scheme. He gave an interview to the BBC’s Stephen Nolan show in December 2016, in which he also alleged the advisers secretly tried to “cleanse the record” of references to Mrs Foster. Mrs Foster told the inquiry that “paranoia set in with Jonathan” after a BBC Spotlight programme revealed the scheme’s overspend, and Mr Bell felt the party was trying to blame him for the debacle. However she said that was not the case, but it was all in Mr Bell’s own mind. 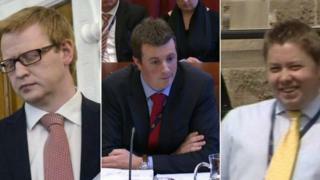 Mr Bell has since told the inquiry that after he went public about RHI, he became the victim of a “massive smear campaign” orchestrated by the DUP. 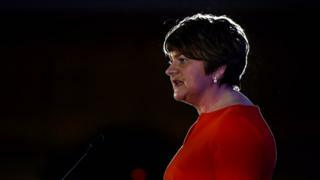 Mrs Foster, who was Northern Ireland’s first minister in December 2016, said he had caused such a reaction with his allegations, some of them “very confused” and that he “had to take what was coming to him”. She set out how assembly and executive officials had agreed a plan to deal with cost controls, but that when Mr Bell spoke to the BBC, that plan went “out the window”. “We were then on a trajectory to the assembly and executive collapsing,” she added. Pressed further on that, she said Mr Bell had “taken a route with Stephen Nolan which caused the downfall of the executive”. The weeks that followed saw Sinn Féin, the DUP’s then partner in government, demand Mrs Foster stand aside as first minister until an investigation into the scheme was completed. She refused to do so, and on 9 January 2017, the late Martin McGuinness resigned as deputy first minister, which led to a snap assembly election. 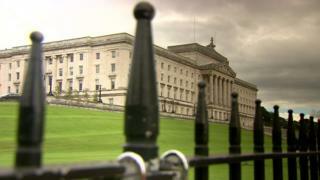 More than a year and a half later, talks deadlines have failed and the Northern Ireland assembly remains in limbo. Earlier on Tuesday, Mrs Foster said it is a “great regret” to her that she did not sack Jonathan Bell as enterprise minister when she became first minister in 2016. Mr Bell replaced her as enterprise minister in May 2015. 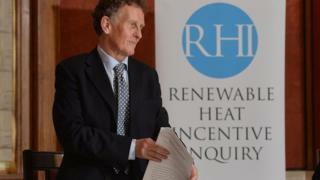 The RHI inquiry has heard evidence from a number of witnesses that he was unsuitable for the job. Asked why she had not replaced him when she took over the party reins, Mrs Foster said an assembly election campaign was looming and that removing him at that time could have raised political questions over his suitability as a candidate for the party. She also claimed there was a concern he could “go in inverted commas ‘rogue’ if he was replaced as a minister” when Mrs Foster replaced Peter Robinson. Mrs Foster said Mr Bell never accepted her leadership, nor did he take his responsibilities seriously and she claimed he acted as if he was “to be served, rather than serve”. She said he “hero-worshipped” Mr Robinson and when he retired, it showed in Mr Bell’s behaviour. “I take full responsibility for my actions as first minister and the decision to keep him in post until the election was over,” she added. Earlier on Tuesday, Mrs Foster was challenged to explain why she forgot about a meeting in which she was told of problems with the RHI scheme. The meeting happened in early June 2015 after Mrs Foster became finance minister. She told the public inquiry – which was set up to investigate the scheme’s failings in January 2017 – the warning was the first time she had been made aware of possible problems. Northern Ireland’s former first minister headed up the Department of Enterprise, Trade and Investment (Deti) when the RHI scheme was designed in 2012. Crucial controls to limit the scheme’s cost were not introduced, something she has since said is her “deepest political regret”. But Mrs Foster – who spent six months as finance minister from June 2015 before being elevated to party leader and first minister – fiercely contested claims by Jonathan Bell, her party colleague and successor as enterprise minister, that she ordered him to keep the scheme open. In the wake of his allegations, she faced calls to step aside to allow a judge-led public inquiry into the scheme. Her time as first minister was brought to an abrupt end when the late Martin McGuinness of Sinn Féin resigned as deputy first minister, forcing an election last March. She remains DUP leader, but there has been no return to Stormont for almost 600 days, due to the ongoing impasse between her party and Sinn Féin. Mrs Foster said she was told about the issues by former DUP special adviser (Spad) Timothy Cairns, who was then working in the enterprise department. He told Mrs Foster that officials in enterprise had “dropped the ball” and failed to ensure the proper approvals were in place for spending on RHI. Mrs Foster said she had “no clear recollection” of the meeting, although she did not dispute that it happened. She said she had conflated the meeting in early June, with another later that month where Mr Cairns had asked for help from Mrs Foster’s ministerial adviser Andrew Crawford, who had just spent seven years in enterprise. Inquiry chairman Sir Patrick Coghlin asked why she had no recollection of the early June meeting. She said she did not believe it had been presented to her as a “big issue”. Mrs Foster said she could not explain why she had forgotten about the meeting, but added she had many matters to deal with in her role as finance minister. 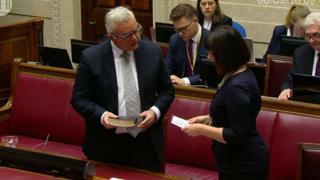 Also on Tuesday, Mrs Foster conceded there was “room for improvement” in how unelected special advisers (Spads) are appointed by political parties at Stormont. The inquiry has already heard claims that the DUP had its own practice of appointing advisers to ministers, which directly went against the ministerial code that states ministers are supposed to choose who they want to advise them. Mr Bell had claimed he would not have chosen Timothy Cairns as his Spad, but he signed a pre-written letter drafted by the party confirming he was choosing Mr Cairns. Mrs Foster told the inquiry she acknowledged the need for improvement, but said it had to come “across the board” from all political parties at Stormont. Sir Patrick said it seemed to him that there had been a common approach by the parties that there was “an act and a mandatory code, but no-one pays a great deal of attention to it”. Mrs Foster said she could understand the panel’s “frustration” about the code, but said there had been legislative changes throughout the past 10 years to how advisers were appointed. “Should there be more, yes I think there probably should, in terms of transparency,” she added. On Tuesday, the DUP leader also said she understood why the conduct of her former closest adviser – Andrew Crawford – was a matter of huge concern for the RHI inquiry. He was her most senior adviser in the finance department in summer 2015, as the scheme’s costs were rocketing. At that time, he was engaged in conversations with the poultry industry, one of the biggest beneficiaries of the scheme. She said she knew Mr Crawford was having discussions with others in the party about energy issues but not specifically about RHI cost controls. But her evidence is that she never asked him for details and he did not provide it. 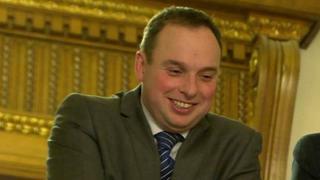 The inquiry has heard how Mr Crawford had a series of engagements with fellow DUP adviser Timothy Cairns about potential cuts in subsidies for businesses on the scheme – many of them poultry farms. Mr Crawford predicted a huge spike in applications – something which later occurred putting the scheme hugely over-budget. He also offered anecdotal evidence that empty poultry sheds were being heated to maximise subsidy returns, and suggested a scheme change that would have ensured poultry farmers maintained their potential income from the scheme even after it was amended. Inquiry panellist Keith MacLean said not only had Mr Crawford been giving “bad advice”, but was suggesting something that worked against efforts to control the scheme spend. Mrs Foster said he never raised allegations of scheme abuse, or the potential of an applications spike with her. She told the inquiry she now believed both of those issues should have been raised with her as finance minister, both because of the alleged abuse and the potential impact of spending commitments on public finances. Dr MacLean said it was not hard to see why the inquiry was concerned about the calibre of people being appointed as Spads. “I accept that,” Mrs Foster said. The inquiry has also heard evidence Mr Crawford sent confidential government documents to family members who were RHI claimants. The documents warned them about the plans to introduce cost controls to remove the lucrative subsidies. Inquiry counsel David Scoffield asked Mrs Foster that if the panel finds Mr Crawford breached standards, to what degree she holds some responsibility for his actions as his former minister. Mrs Foster said she was accountable for Mr Crawford’s behaviour, as she was for all her departmental officials. But she said she failed to see how she could “be responsible for that breach”, if a special adviser acted outside the rules. “If he had committed a criminal offence as a Spad, I don’t see how the panel would be asking me to be responsible for that,” she said.